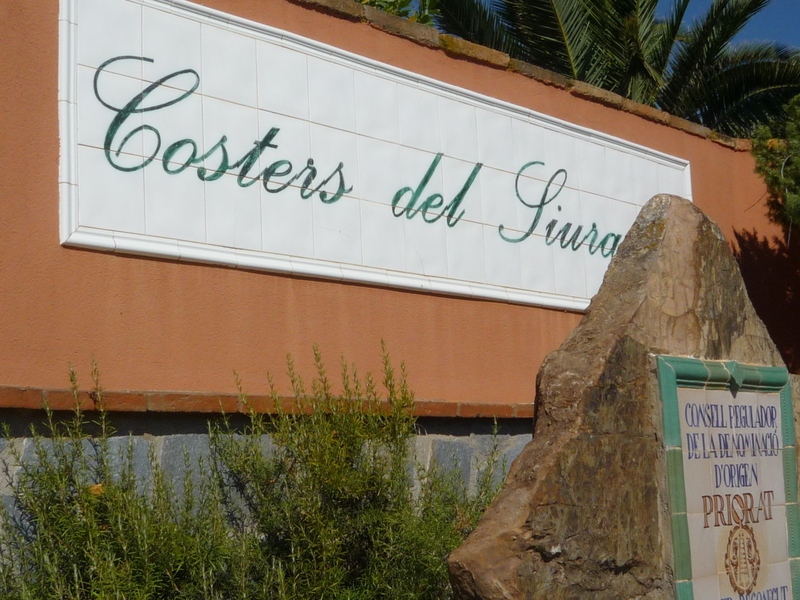 We enjoyed a lightning-fast tour of the winery, and the over-the-top banter of our host Carles. 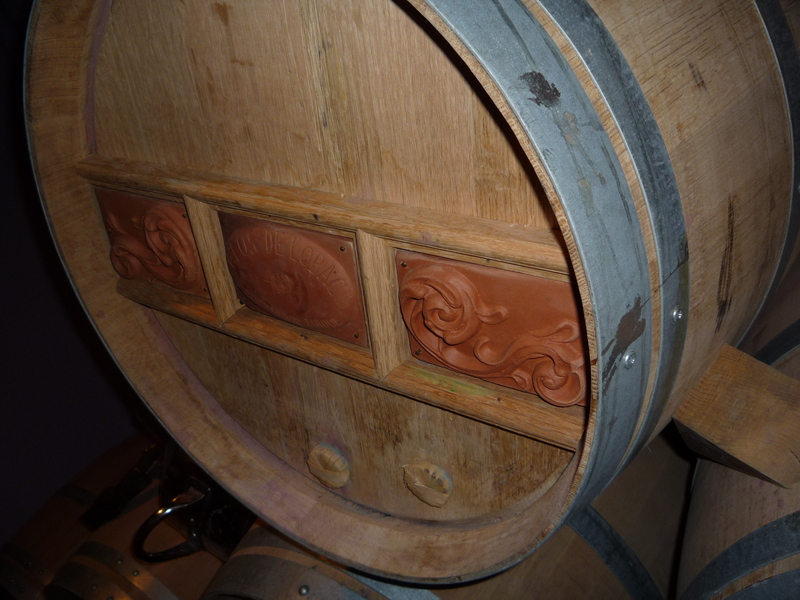 Carles’ wife designed these beautiful clay adornments for the French oak (the smaller pore in the wood as compared to American oak means less contact with oxygen) barrels used to age and store the wine at the winery, very lovely! 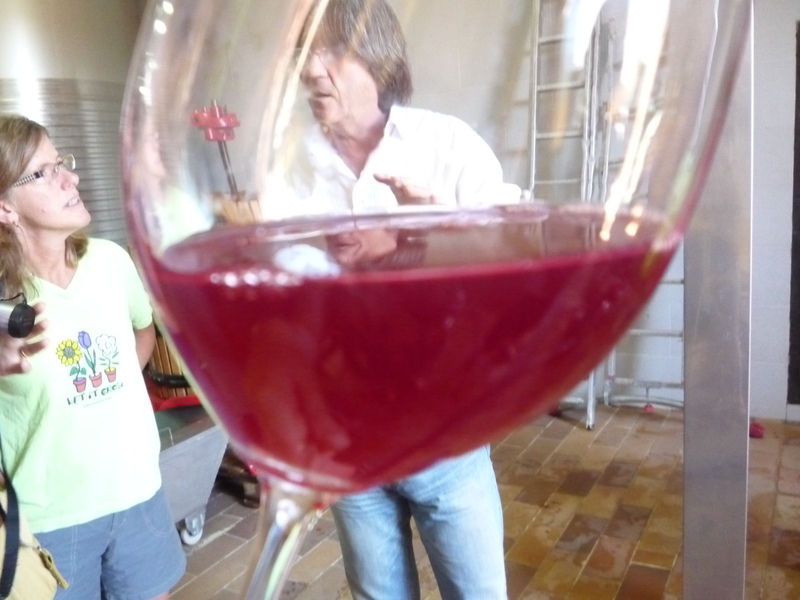 During our visit, we even got to see the wine press in action, and we even got to taste freshly-pressed grape juice. This juice would grow up to become a rosé, as I recall. Check it out! 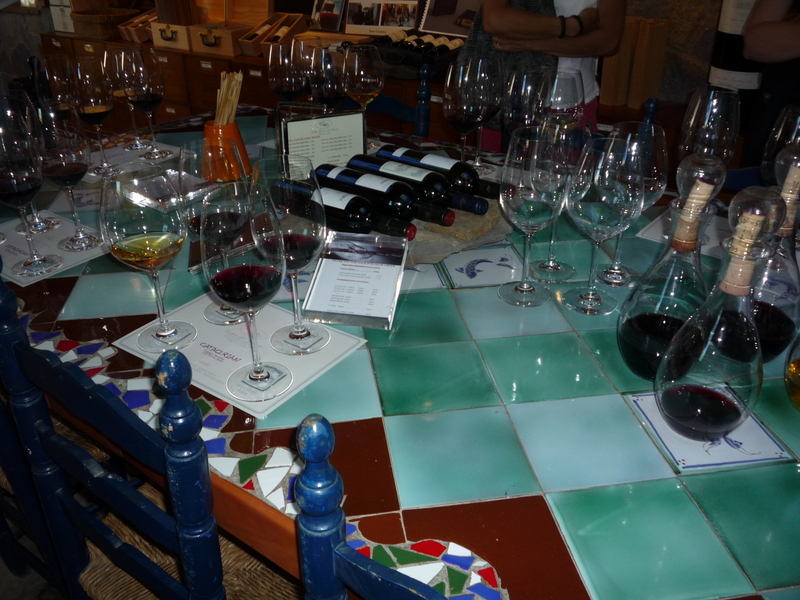 Each place at the table was set with the four wines we would try: Clos de l’Obac, Miserere, Kyrie, and Dolç de l’Obac. Even cooler was what we found upon closer study of the mise-en-scène—we felt like movie stars! 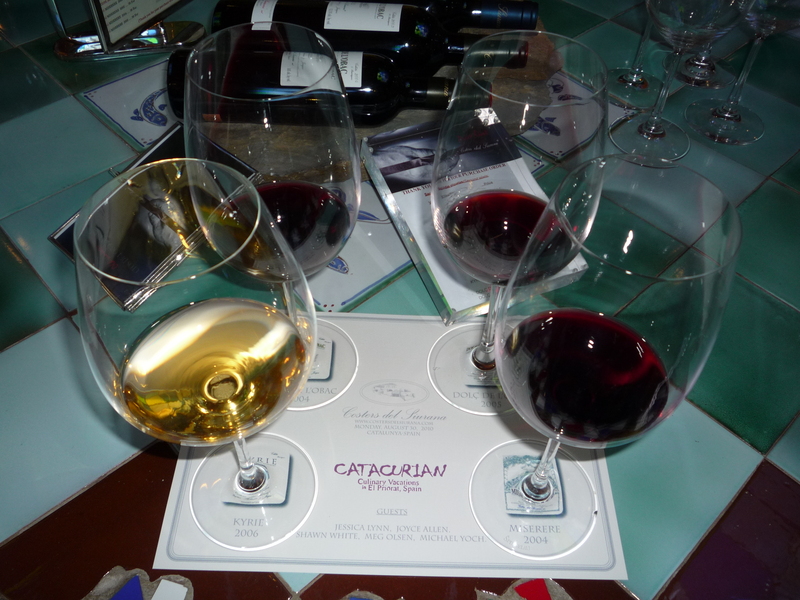 The wines themselves were really amazing, including a white wine (Kyrie) which was not served chilled. It was reportedly made using a blend of 35% Garnacha blanca, 35% Macabeo, 30% Xarel.lo and 5% Moscatel de Alexandría grapes, and had such body that I would have guessed I was drinking a red wine if I hadn’t seen the glass. It was really incredible. 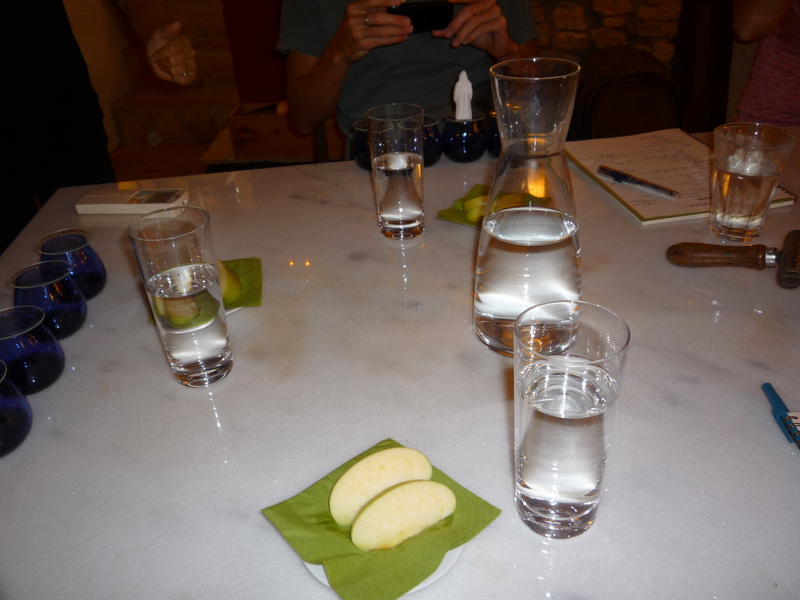 During the tasting, we learned that our host Carles had published a book titled “12 + 1: The Friar’s Dozen. 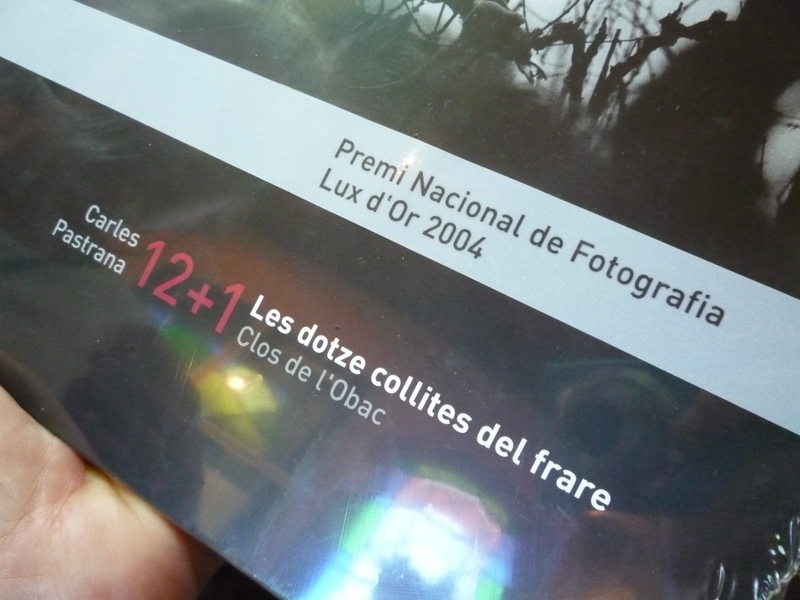 Thirteen Vintages of a Priorat Wine,” which had won a national photography prize in 2004. 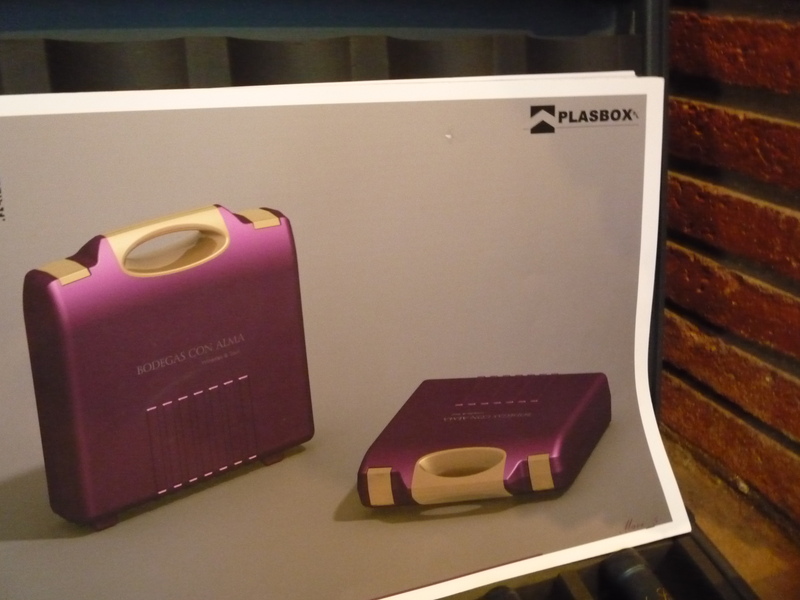 We also learned about an ingenious new product used to ship wine: a briefcase-sized hard plastic case which held 5 bottles: the Plasbox. 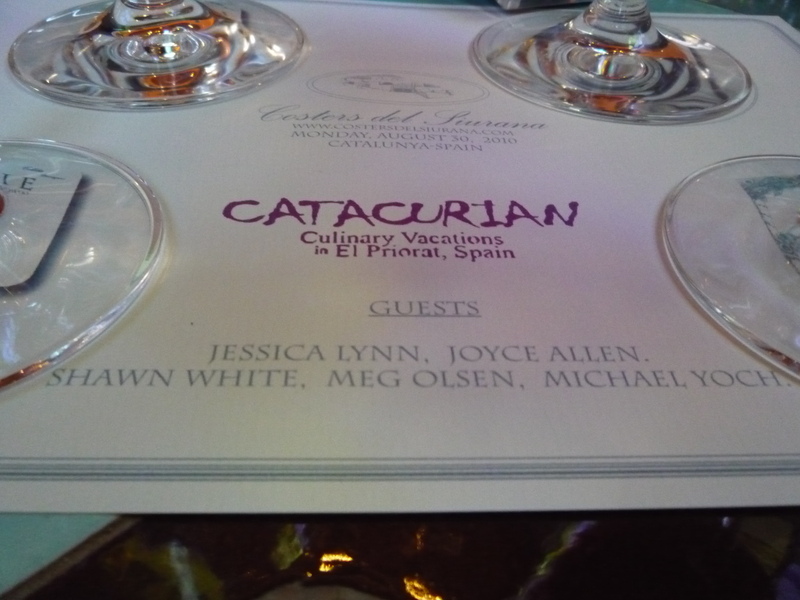 We bought plenty of wine, and then headed back to Catacurian to prepare for lunch. 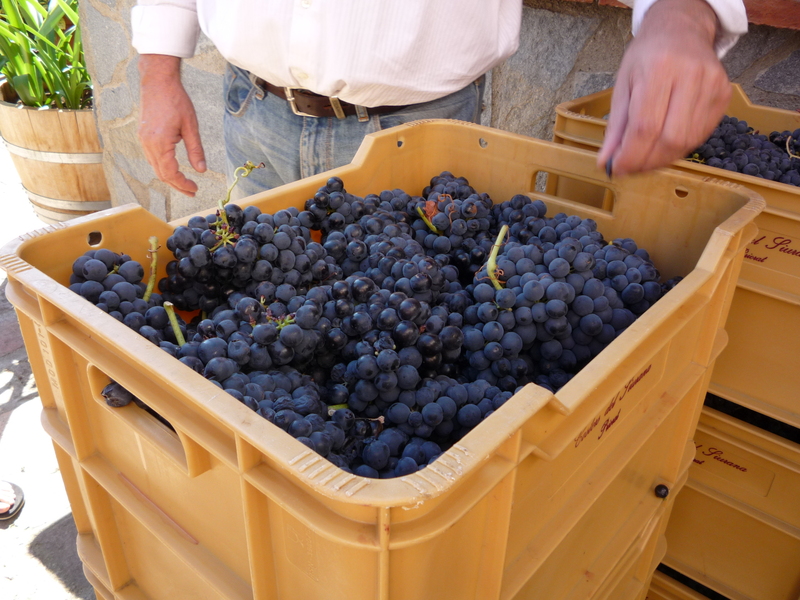 Adéu, Clos de l’Obac! Our vinaigrette for this delicious salad was honey, thyme, olive oil, pepper, salt, and vinegar. 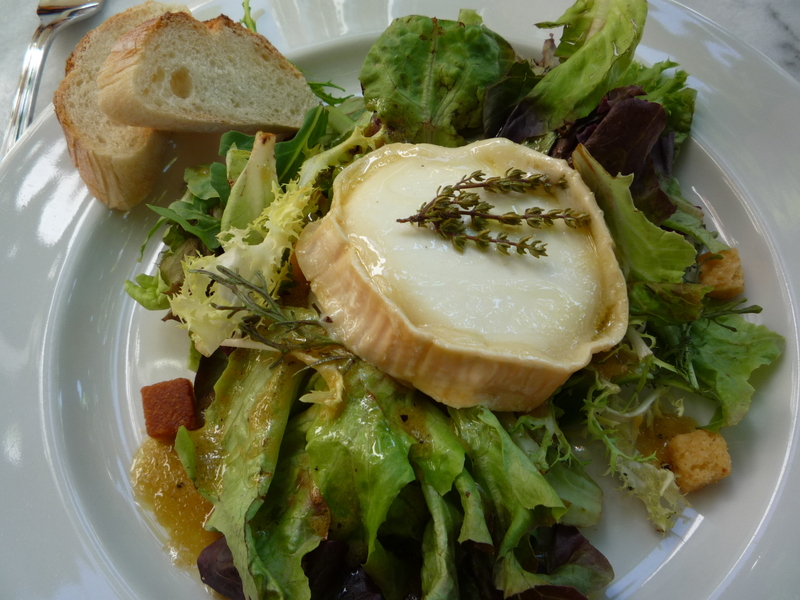 And that extraordinary-looking round of cheese was lightly warmed in the oven, OMG-delish! 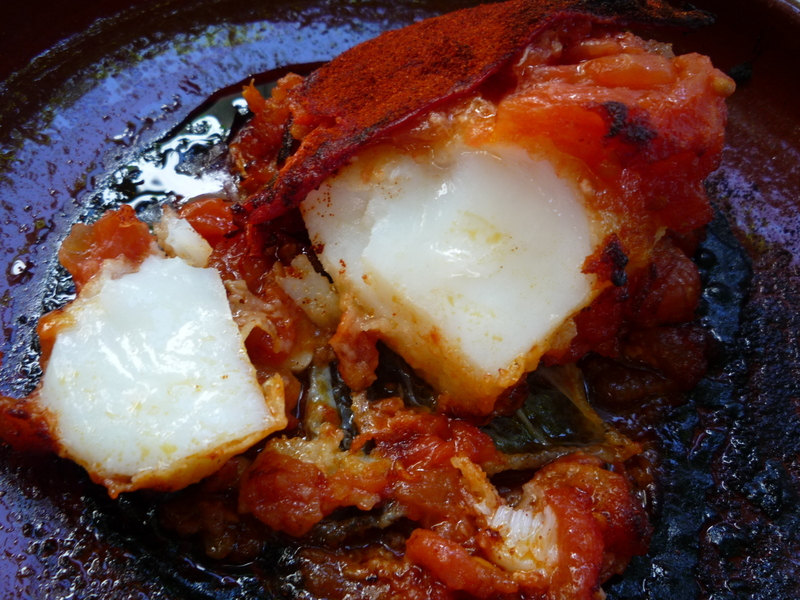 Our salad was followed with this amazing salt cod dish: re-hydrated, roasted, and covered in pimentón ahumado-a smoky spice similar to paprika if paprika were stored in mesquite barrels. So moist and tasty! Our new friend Michael (who looks remarkably like my youngest-and-sketchiest brother, Dave) got called out for referring to the aforementioned pimentón as “paprika.” Big no-no! He was in the doghouse for the rest of the day. This punishment, however, seemed bearable given our lunchtime beverage choice. 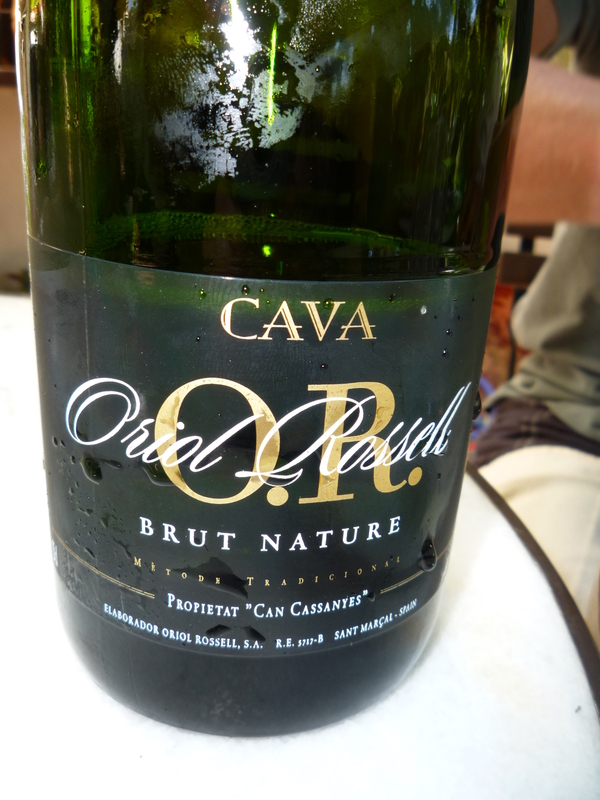 We accompanied our lunch, as we did most of our lunches, with this Oriol Rossell cava – soooo refreshing for the hot weather and a super tasty accompaniment to any- and everything! We also learned about cold-extracted versus cold-pressed: Cold-extracted oil is extracted using a centrifuge to separate solids from liquids, while cold-pressed is simply pressed. 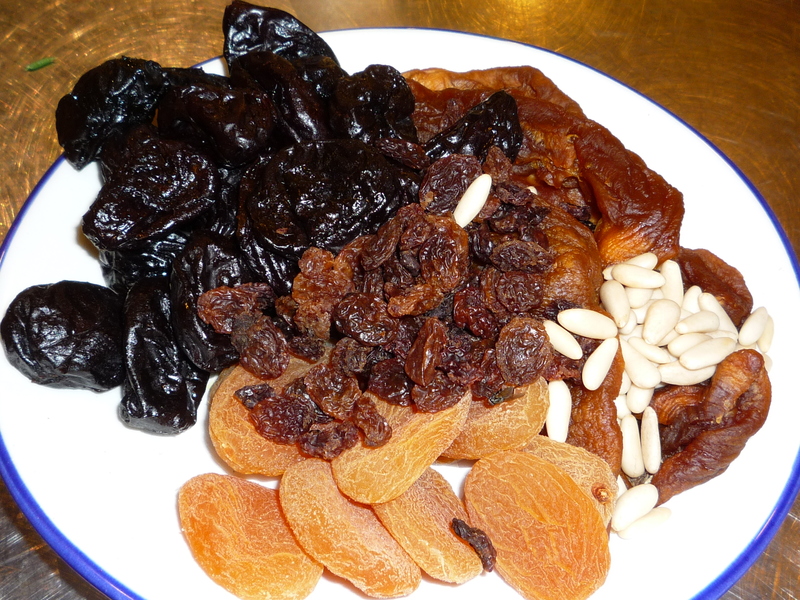 As I understood it, cold-extraction can help avoid a more bitter taste imparted by minimal contact with the olive pits which have been crushed to press out the oil. 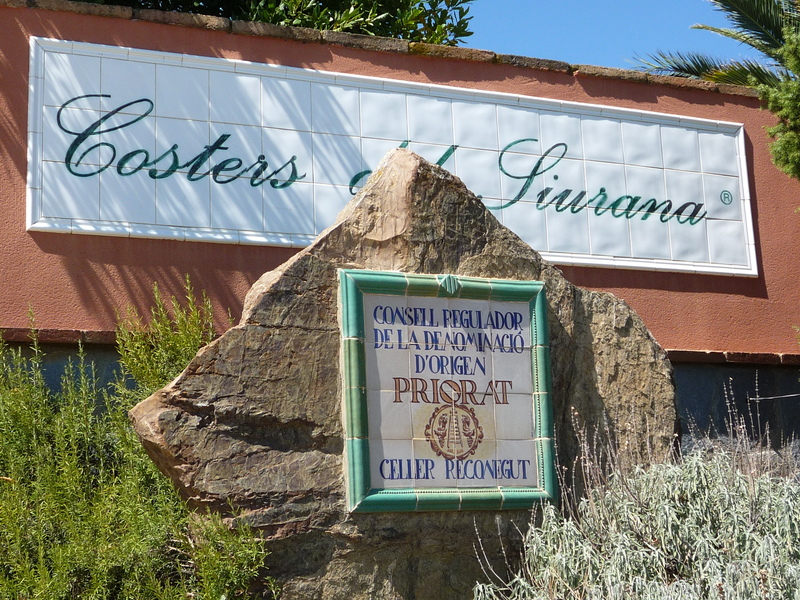 The most commonly-found olive of Catalunya—or at least the Priorat and Monsant regions of Catalunya—is the Arbequina olive. 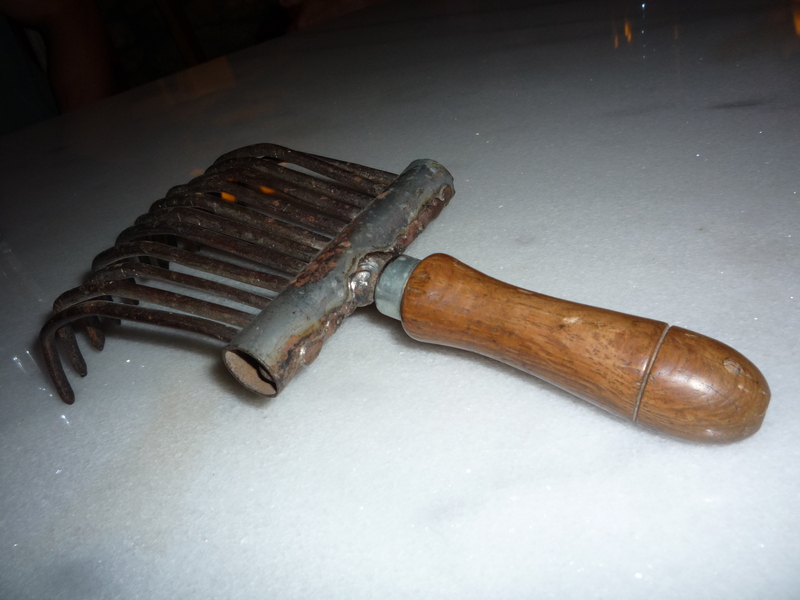 It is very small, and when harvest time arrives, olive growers actually use a rake-type tool to “comb” the olives out of the tree. When the olives fall from the branches, they are collected in fine mesh nets placed below the trees. All in all, a super interesting experience. I learned a lot! Next up was dinner. We had special guests, as Alicia’s brother Alberto and his kiddos were to join us. Alberto is trying to figure out how to open up membership to the wine club for his small winery to include folks from the States. 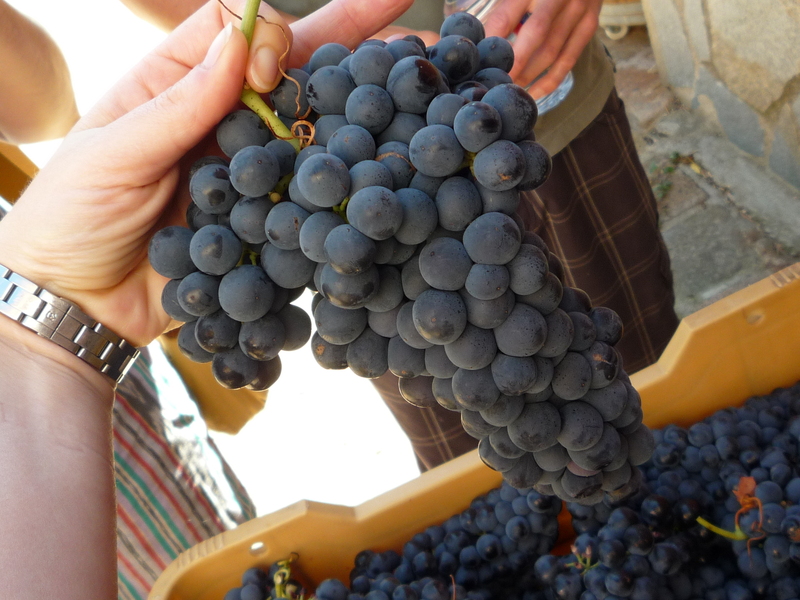 If any of you readers know about importing/shipping wines for personal comsumption (it would end up being something like 6 cases or 12 cases per member per year, probably all shipped at once, and several liters of olive oil also), please let me know and maybe we can help him figure things out. The process is arduous. Instead of the velvety emulsification provided by the traditional an egg yolk, the texture is less creamy, but still very tasty. 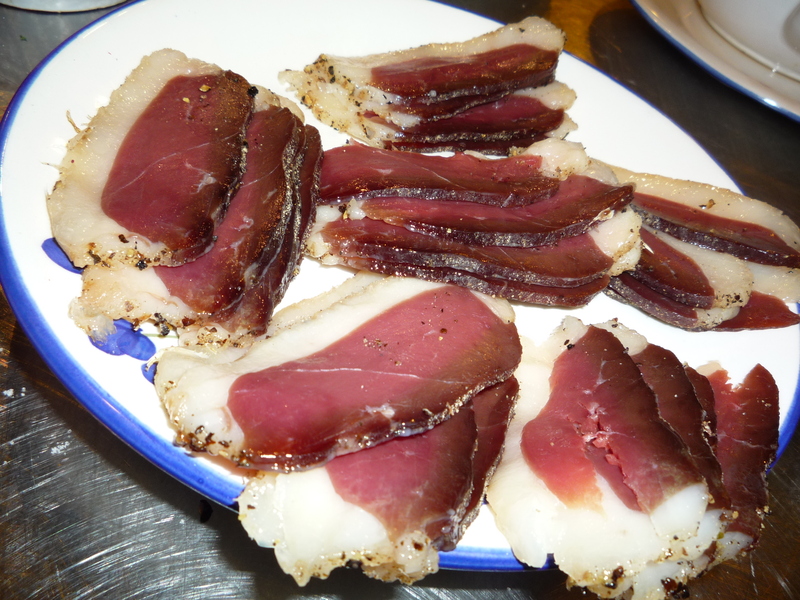 Next up was to prepare an appetizer of white asparagus (canned, to my surprise) served with cured duck breast. We learned just how easy it is to cure your own duck breast instead of paying out the wazoo for already-cured duck breast. 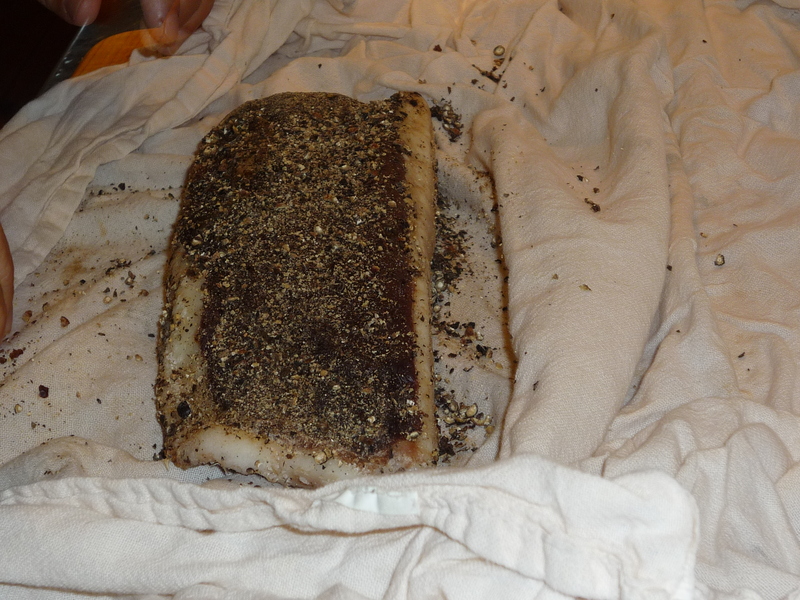 Seems it is as easy as buying a duck breast, covering it thickly with sea salt, put it in the fridge for a 24-30 hours, brush off the salt, add a ton of black pepper, wrap in a flour sack towel, and stick it back in the fridge, uncovered. 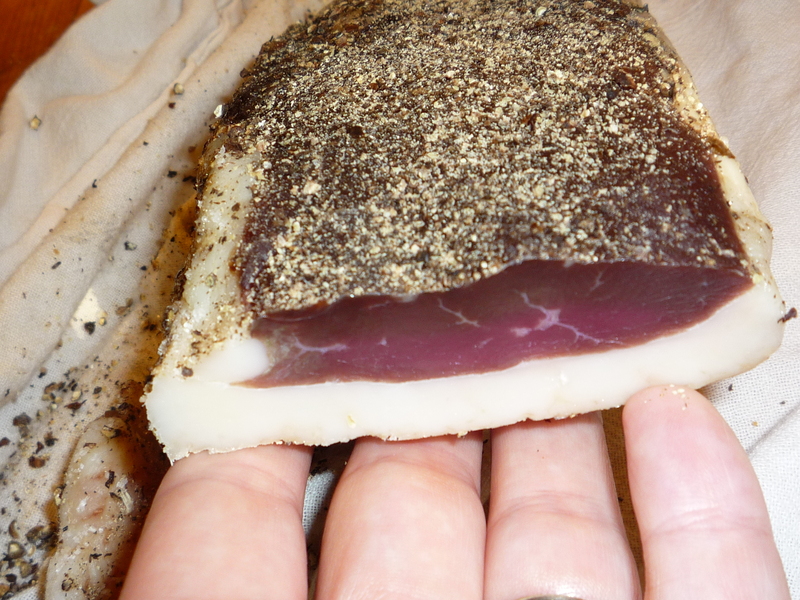 Two weeks later, you have duck ham! It will keep pretty indefinitely in the towel in the fridge, and you can slice off the bits you feel like eating. I can’t wait to try it at home! Here’s Alicia’s version. Isn’t this lovely? The white asparagus was an adventure for various reasons. First, the can opener we were to use was of the kind I hadn’t seen in YEARS. Tiny and hand-cranked, this was the kind of can opener my grandma had at the back of her drawer, and that, when I was a kid, we took along on pop-up trailer-type weekends where we ate pork n’ beans and deviled ham (I know, I know) for breakfast, lunch, and dinner. Michael, the oft-chosen recipient of all the icky jobs in our Catacurian kitchen, took on the challenge. The second reason it was a hoot to work with white asparagus was that the brand name for them was “Cojonudos.” Evidently one of the Spanish kings pronounced these unusual vegetables to be “cojonudos” when they were served to him at some dinner waaay back in the day – a very positive proclamation from the royal lips. 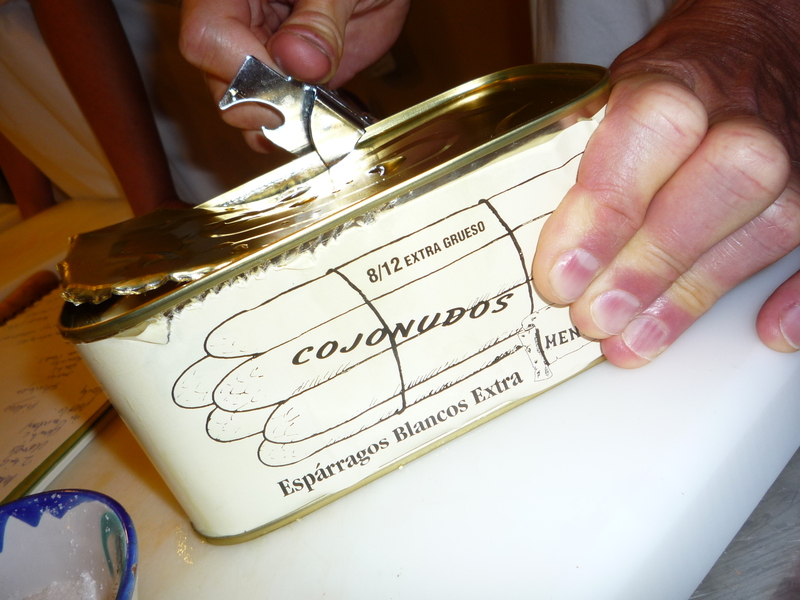 To me, however, and to many other Spanish-speaking folks, “cojonudo” means literally “a guy with really big balls.” Total puerile crack-up, and then it becomes even more hilarious when you add the “8/12 Extra grueso” since “extra grueso” means “extra thick.” Har har. 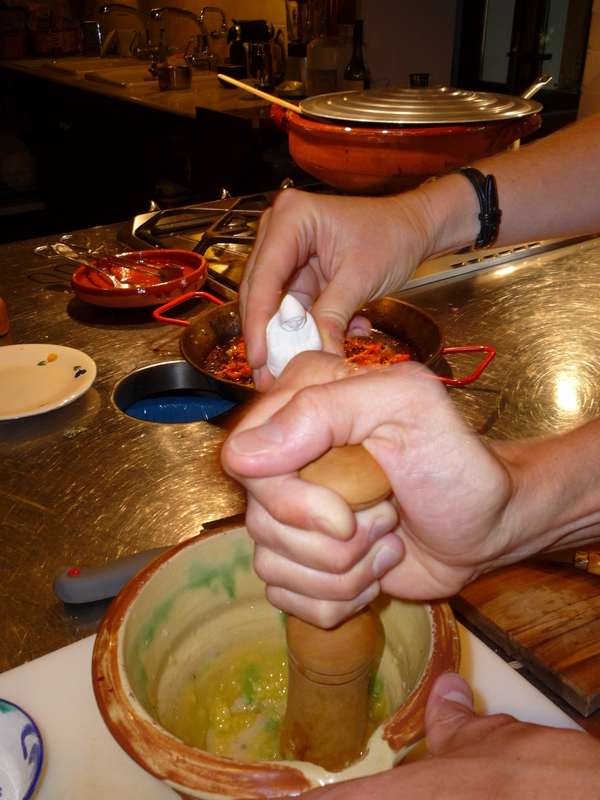 Our final lesson for the evening was to learn the recipe for shrimp fideuá – sort of similar to paella, but using fideo noodles instead of rice. Make a sofregit, add your shrimp to brown lightly, add fideos you’ve fried in olive oil, cover with hot stock, add saffron, cook for a bit and serve with the amazing egg-free garlic aioli. 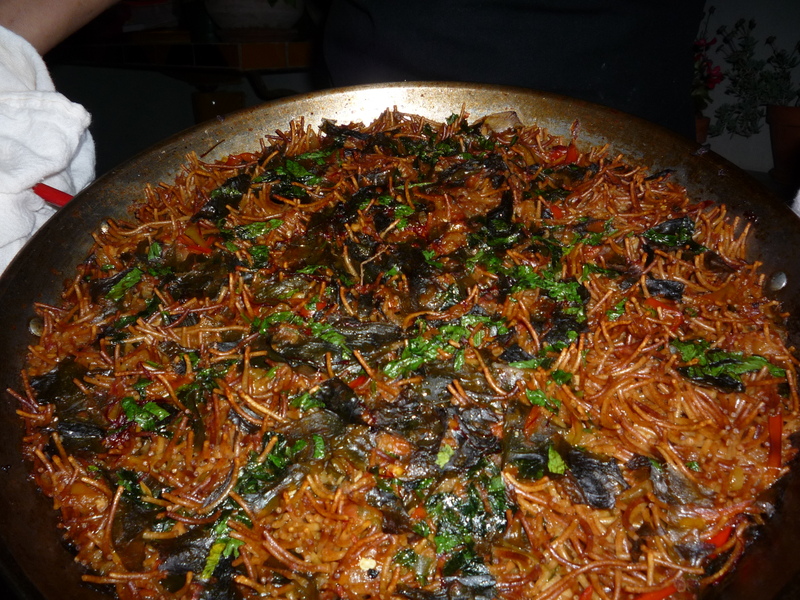 This fideuá is made with seaweed and other delights, but it definitely looks scrumptious! 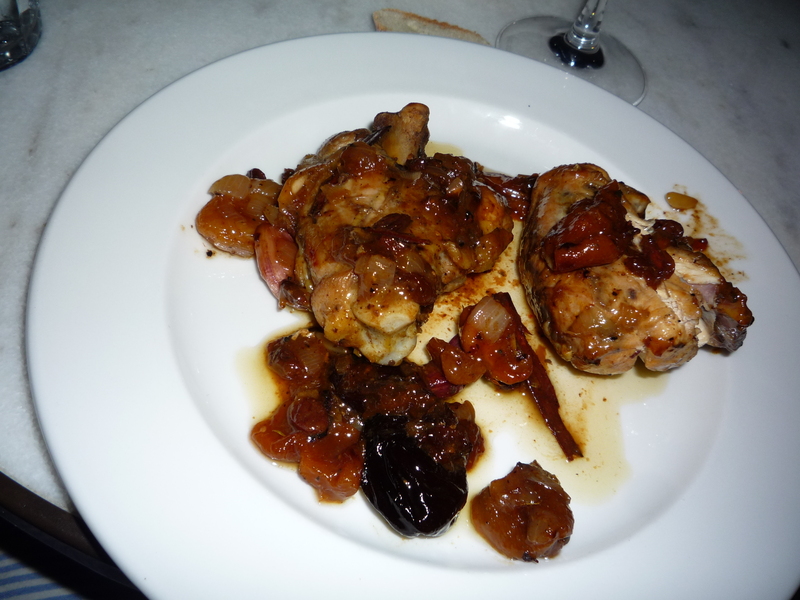 Once again, we dined in the garden, doesn’t our chicken look yummy? 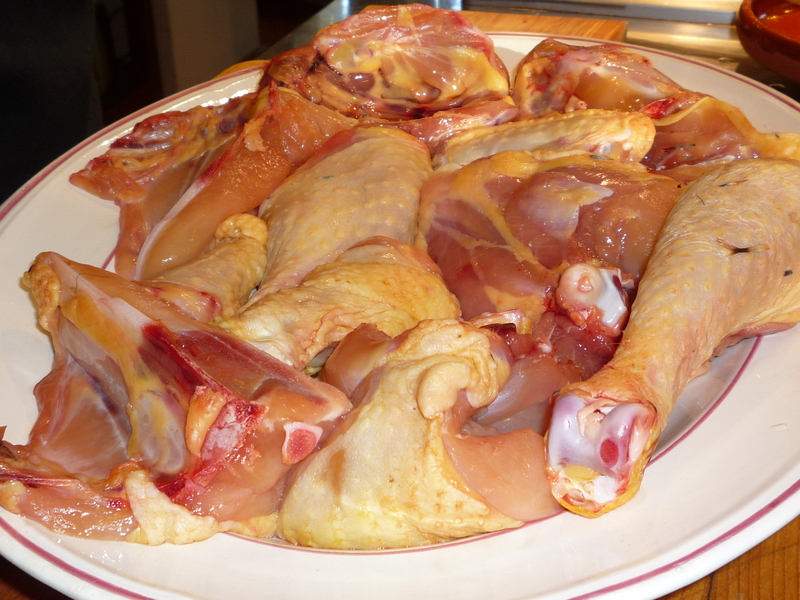 Those of you who know I’m a little skeevy about picking meat off my chicken bones will be delighted to know that I picked the whole thing absolutely clean—Fernando clean, even. 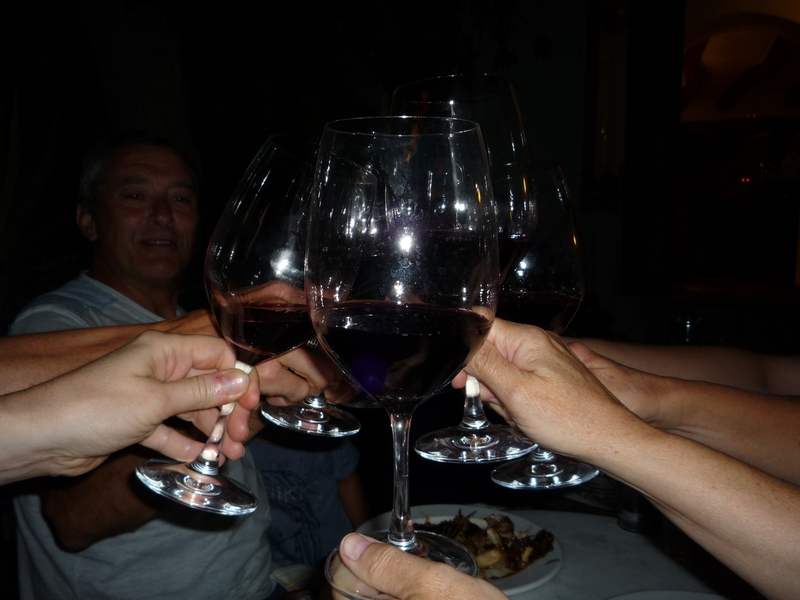 We accompanied dinner with wine from Clos de l’Obac, what a fabulous treat! Here’s to a grand and action-filled day! Let me correct a couple of inaccurancies. 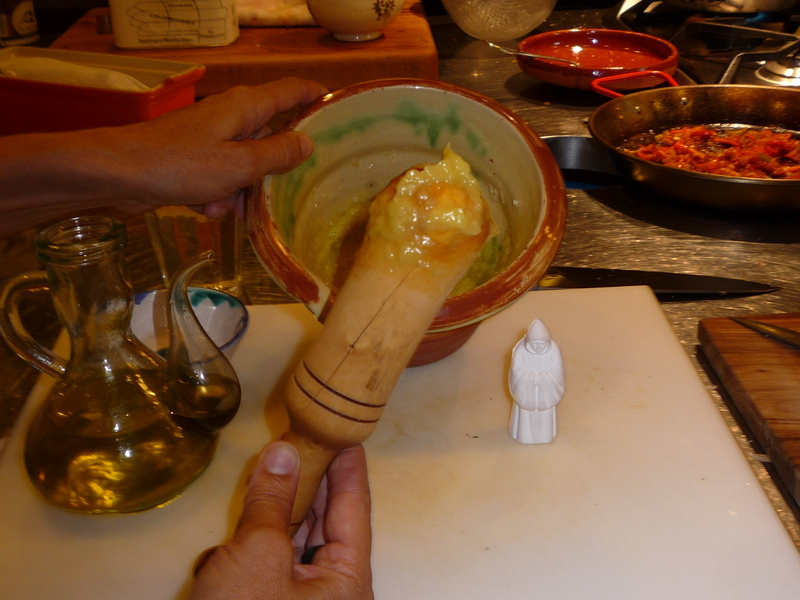 >>>in many restaurants in Spain, chefs avoid making “real” mayonnaise-based aioli due to concerns about food safety when using raw eggs. 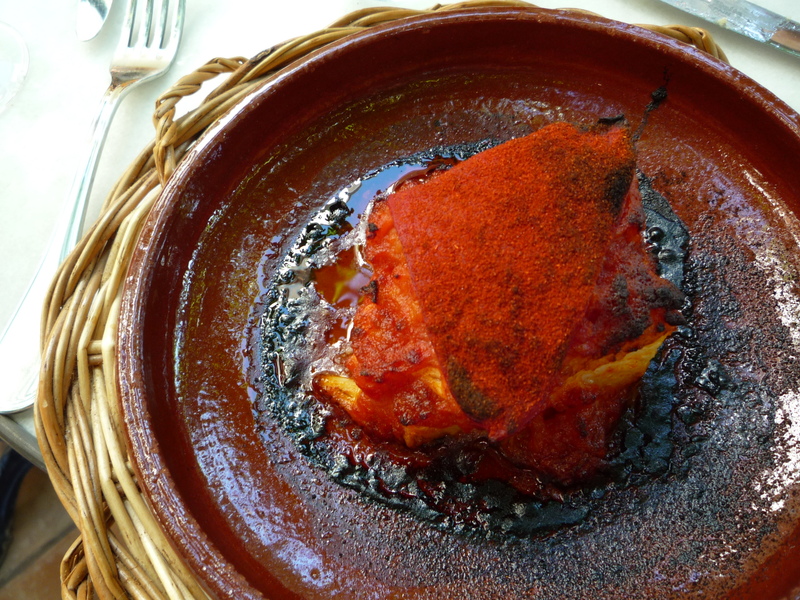 In *all* restaurants in Spain, chefs avoid making raw egg mayonnaise or alioli because of safety food regulations prohibit them doing so. They use pasteurized eggs when needed. It’s not an alternative. That’s the *real* traditional aioli. 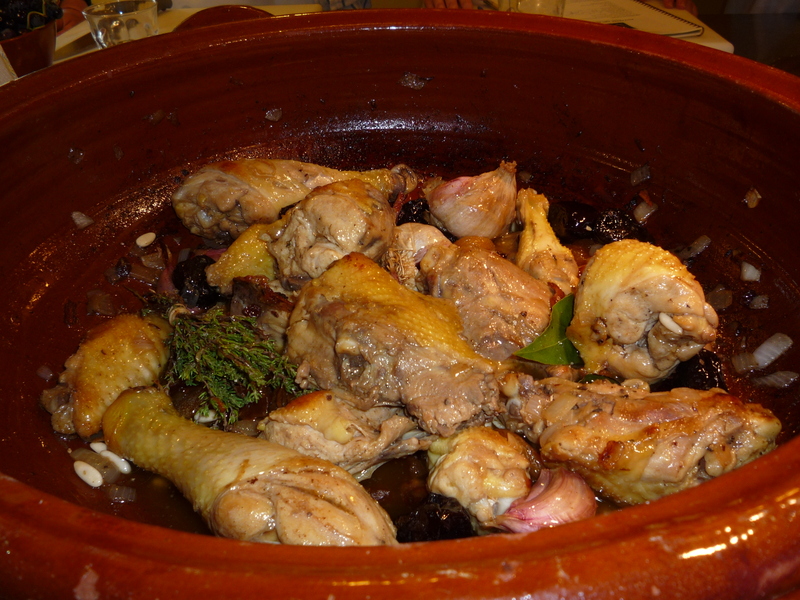 Just “all i oli” (garlic and oil). As an after thought other ingredients were added. 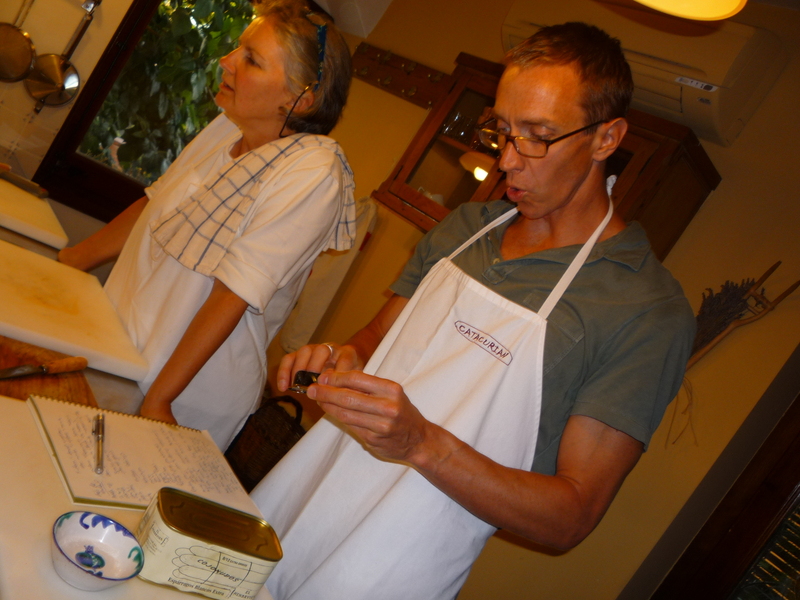 Be them eggs, for the mayonnaise style; or sweet fruits, pear and/or quince are most usual; or tomatoes, for a very special fresh tomato sauce; or …. Thank you so much for your comment – this is a wonderful clarification, and much appreciated!